The 2017 Stone Horse Builder’s Cup, a one-design race limited to the 23-foot Stone Horse designed by S.S. Crocker and built by Edey & Duff, formerly of Aucoot Cove in Mattapoisett, MA, was held Saturday, August 12 in the waters off Padanaram, MA. The race, delayed by one hour due to the threat of thunderstorms, was beset by fluky winds out of the east-southeast and the course was ultimately shortened to two legs because of the light air. The wind went light just before the starting gun, leaving boats in irons on the starting line and resulting in a few slow motion near-collisions. Sailing Metaphor out of Wareham MA, David Neumeyer and crew Bill McBrine and John Balletto took first place. Second place went to Able (Newport RI), skippered by Dave Kane with crew David Hanos, Christopher Roche and Whit Bodman. Third place was claimed by Phil McGlave of Minneapolis, MN and crew Tom Clemow and Alan Gaulke, who sail Blue Jay out of Westport, MA. Finishing just out of the money was Patience, with newcomer Rob Pirozzi of Mattapoisett MA at the helm, with crew David Wiley, and Melissa & Bryan Guzek. 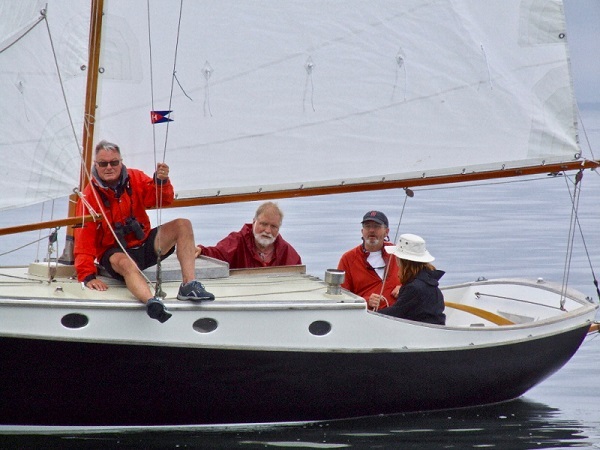 “Also rans” were Butterfly, sailed by Vern Tisdale of Mattapoisett with crew Josh Orr and Ship Orr, and Windfall, sailed by Tom Kenney of South Dartmouth, MA and crew Ellie Whelan, Tommy Kenney and Pat Sheehan. Post race festivities were hosted by Ann & Tom Kenney at the New Bedford Yacht Club. A special thanks to Jack Mallet, skipper of the support boat Acadia, and Walt Suchon, skipper of the committee boat Sabrosa, and also a shout out to Barbara Veneri and Ed Pavao, who served on the Race Committee. Sound Sailing to the Rescue!